Higher reaches of Jammu and Kashmir received light snowfall while rains in the plains broke the long dry spell in the Valley. Gulmarag, the famous tourist destination in Kashmir, witnessed seasons first snowfall. The snowfall has raised hopes among people associated with tourism for fresh arrival of tourists. Gulmarg tourist resort in north Kashmir was the only place to record sub-zero minimum temperature last night at minus 2 degrees Celsius. The ski resort received fresh snowfall last evening even as rest of the valley was hit by rains. Gulmarg recorded 1.4 mm snowfall, about 2 to 3 inches, and it may continue for coming days too. It is a world famous destination for snow skiing, athletes as well as tourists wait for snowfall in Gulmarag. 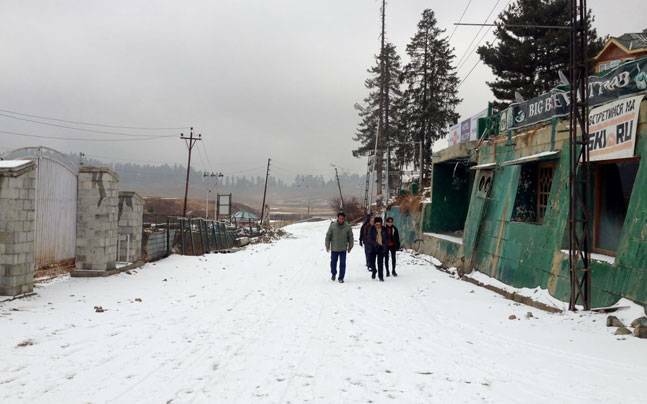 “Snowfall has started and it will attract tourists,” said hotelier Aijaz Ahmad. Tour operators as well as Hoteliers have started fresh discount schemes for tourists in this winter season to attract more and more tourists.